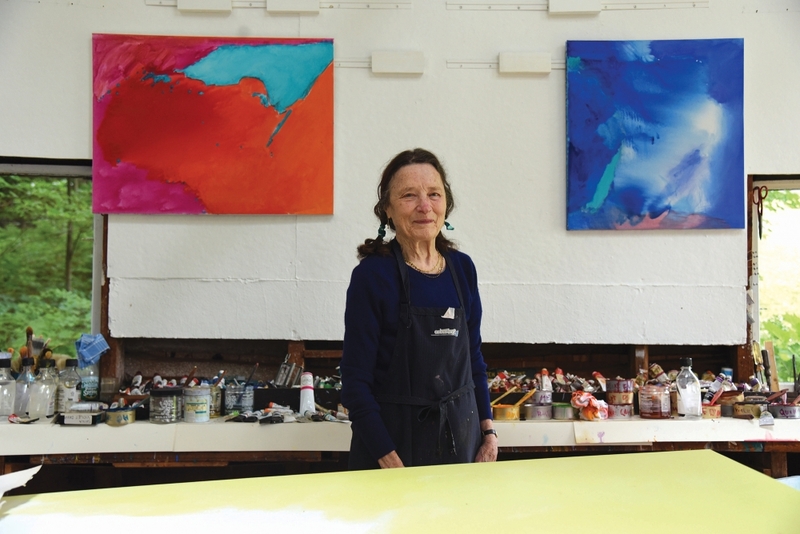 BRATTLEBORO, VT -- Renowned abstract painter Emily Mason, who for the past 50 years has divided her time between New York City and Brattleboro, Vermont, will give a talk about her life and career at the Brattleboro Museum & Art Center (BMAC) on Friday, October 19 at 7 p.m. Admission is free, with seating available on a first-come, first-served basis. The backdrop for Mason's talk will be the exhibition "Emily Mason: To Another Place," which opened at BMAC on October 5 and remains on view through February 10, 2019. The first museum survey of the 86-year-old artist's work, the exhibition consists of 50 paintings created by Mason between 1958 and 2018, many of which have never been shown in public. According to BMAC Chief Curator Mara Williams, Mason "revels in the beauty of paint itself. She explores and exploits its materiality, pushing technique to the edge. Many of her paintings begin with a pour, a chance action that places one color on a white ground. The shifting directions of the drip lines provide evidence of how the artist manipulates both paint and surface." In the documentary "Emily Mason: A Painting Experience" by RAVA Films, Mason articulates her artistic process as follows: "I always begin a painting with a blank canvas and not any preconceived idea of what it’s going to look like. I just sort of react. I can’t predict it, so I let the materials suggest the next step and then take it from there. It’s a process of letting a painting talk to you. I want painting to take me to a place I’ve never been." Emily Mason has been immersed in art since she was born. She is a descendant of John Trumbull, known as "The Painter of the Revolution," whose 1817 painting "Declaration of Independence" was reproduced on the bicentennial two-dollar bill. Mason's mother Alice Trumbull Mason was a trailblazing artist and founding member of American Abstract Artists, an organization that provided vital exhibition opportunities to abstract artists in the 1930s and early 1940s, when abstract art was met with strong critical resistance. Mason recalls childhood visits to the group's openings and to her mother's studio, where she encountered the likes of Piet Mondrian and Joan Miro. Born and raised in New York City, Mason graduated from the High School of Music & Art. She studied at Bennington College, graduated from The Cooper Union, and spent parts of three years studying on a Fulbright grant at the Accademia di Belle Arti in Venice. While in Italy Mason married the artist Wolf Kahn, whom she had met previously in New York. In 1968 Mason and Kahn purchased a farm in Brattleboro, Vermont, where they have lived and worked each year from late spring through early fall. Emily Mason's work has been exhibited in New York and elsewhere since the 1960s. Her paintings are held in numerous public and private collections. "Emily Mason: The Fifth Element," a comprehensive treatment of her work by Art in America associate managing editor David Ebony, was published in 2006 by George Braziller publishers. A second monograph, "Emily Mason: The Light in Spring," was published in 2015 by University Press of New England. In conjunction with the exhibition in Brattleboro, BMAC has published a limited-edition, 76-page exhibition catalogue containing an essay by BMAC Chief Curator Mara Williams, a chronology of Mason's career, and images of all 50 paintings in the exhibition. To purchase a copy, visit BMAC in person or online at www.brattleboromuseum.org. Founded in 1972, the Brattleboro Museum & Art Center presents rotating exhibits of contemporary art, complemented by lectures, artist talks, film screenings, and other public programs. The Museum's galleries and gift shop are open every day except Tuesday, 11-5. Regular admission is $8 for adults, $6 for seniors, and $4 for students. Members and children 18 and under are admitted free of charge. Located in historic Union Station in downtown Brattleboro, at the intersection of Main Street and Routes 119 and 142, the museum is wheelchair accessible. For more information, call 802-257-0124 or visit www.brattleboromuseum.org.